European starlings are eight to nine inches in length, have a wingspan of 12 to 16 inches and weigh two to three ounces. Males and females have a similar appearance. Starlings are black birds with pointed, triangular wings, short, squared tail and pale pinkish-red legs. In the winter, the feathers are spotted with white or cream and the bill is dark brown or black. During the summer months (breeding season), the feathers on the head and body have an iridescent greenish purple color and the bill is yellow. Juveniles are gray-brown. European starling in breeding plumage. Check out the Cornell Lab of Ornithology All About Birds website on European starlings for audio clips, ID info and life history. European starlings were purposefully introduced in New York in the 1890s. The population had expanded its range into Illinois by 1922. Today, the starling is one of the most abundant birds in Illinois and is a year-round resident throughout the state. European starlings are very social birds. They often congregate in huge, multi-species flocks during the fall and early spring. A single flock may number in the thousands. When they fly together in large numbers in coordinated patterns it is called a murmuration. Starlings are also very good mimics. Some of the many species calls that they imitate include Killdeer, Red-tailed hawk, Northern flicker and Eastern meadowlark. European starlings consume large numbers of pests such as cutworm and Japanese beetles. However, they are cavity-nesting birds and compete with native cavity-nesting birds for nest sites. 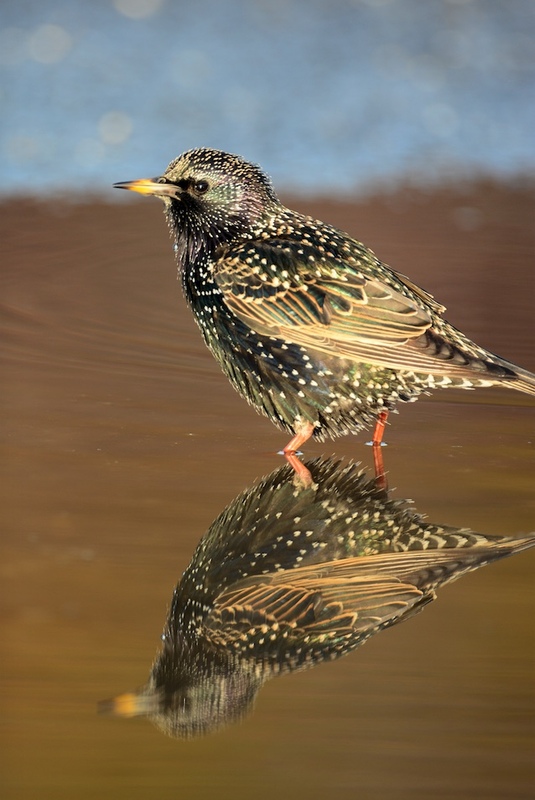 European starlings can carry histoplasmosis and salmonellosis. Human exposure to disease is possible by inhalation of dust from nest materials and exposure to starling droppings. European starlings are common in many habitats including urban and suburban areas, farmsteads, agricultural fields, livestock areas, forest edges, landfills and commercial areas. European starlings primarily forage for food on the ground. They eat many types of insects, larvae, berries, corn, grains and seeds. They are common at bird feeders during the winter months. European starlings will nest two to three times a year (late March through late July). They nest in cavities and line the cavity with a bulky assortment of grasses, small twigs, straw and string. The female lays four to six bluish or greenish white eggs and incubates the eggs for 12 to 14 days. Nestlings remain in the nest for 18 to 21 days. The adults will continue to feed the young for several weeks after they have fledged (left the nest). 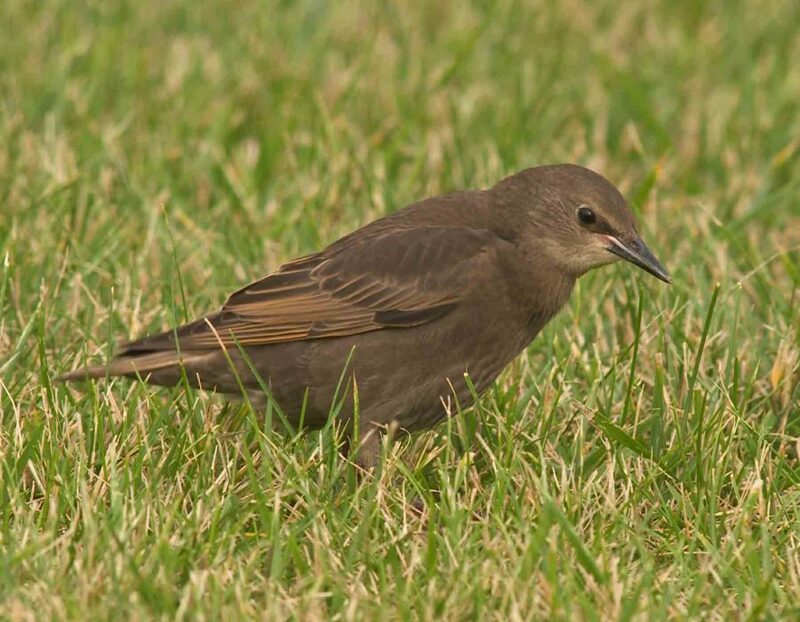 Juvenile European starlings are a gray-brown. A large number of European starlings do not survive their first year. 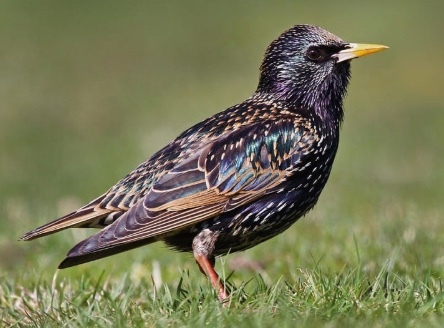 The oldest recorded wild starling lived for 15 years. The majority of starlings would not be expected to live that long. European starlings can become nuisances when they congregate in large numbers at livestock facilities or in roost trees in urban areas. During the breeding season starlings quickly move into cavities accessible to them such as vents, louvers and structural defects in buildings (overhangs or siding). 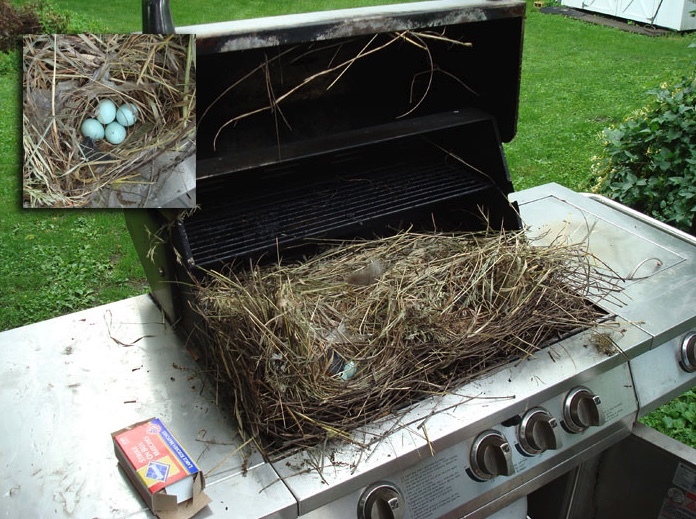 European starlings nested inside this unused gas grill while the lid was closed. Removing food (bird seed, suet), water and shelter can help reduce starling numbers, as can reducing access to garbage. Another control method is to discourage starlings from using an area by eliminating potential nest sites and removing their nests. 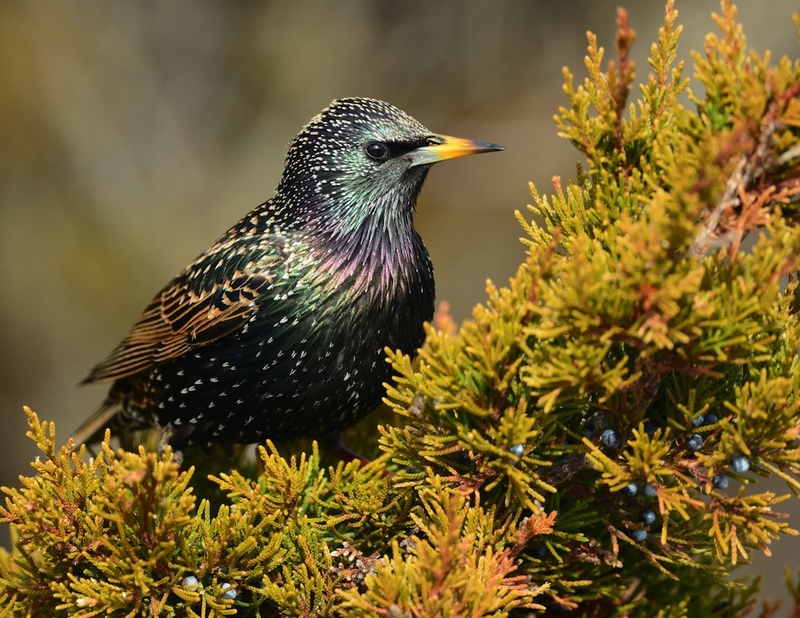 In residential areas, starlings will nest in bird boxes, tree cavities, air vents, louvers and partially enclosed areas such as damaged eaves. Starlings and their nests are not protected by law, and their nests can be removed without a permit. Nests should be removed wherever they restrict air flow in a vent or louver. However, be careful not to remove nests of other bird species, especially when removing nests from bird houses, since native birds such as the eastern bluebird, house wren, tree swallow and chickadee are all protected by the Migratory Bird Treaty Act and the Illinois Wildlife Code. Dispose of nesting material in the garbage so that is not available for the next nesting attempt. Holes in buildings that are larger than one inch should be closed off with hardware cloth to exclude starlings. Make sure birds are not trapped inside the building and then repair the hole. Regularly check air vents, louvers and building eves for damage and repair any holes. Remove nests before making repairs. Ledge protectors (commercially available strips of protruding metal spikes) can prevent starlings from roosting on ledges. To be effective, the entire ledge must be covered. The use of plastic or rubber strips hung in the doorways of farm buildings has been shown to be effective in excluding starlings. The 10-inch wide strips should be hung with 2-inch gaps between them. Nylon or plastic netting can be used to prevent starlings from gaining access to small fruit trees, berry bushes or grapes. The Cornell Lab of Ornithology is a good source of information about controlling non-native species at nest boxes. Tactile repellents are not recommended. Other birds may come into contact with the repellent, which may impair their ability to fly or stay warm if the product comes into contact with their feathers. Frightening devices such as Mylar tape, eyespot balloons, bird of prey forms and alarm calls may work temporarily. Using several devices and moving their locations can increase their effectiveness. However, European starlings quickly become acclimated to frightening devices. Frightening devices are not considered a viable long-term solution for starling control. Starlings can become a nuisance when they roost in large numbers in trees in residential or commercial areas. Besides the noise, the buildup of feces underneath the trees can become a problem. Harassing the birds, by spraying them with water from a hose or making loud noises, as they come into roost can scare the birds away. This technique must be repeated for several days in a row and must begin as soon as the starlings come in to roost. Thinning the branches of roost trees will make them less attractive to starlings. In woodlots, thinning the number of trees can also help discourage starlings from roosting in the area. This work is best done by a professional forester or arborist. The United States Department of Agriculture Animal and Plant Health Inspection Service Wildlife Services (USDA APHIS-WS) should be consulted regarding large starling roosts in residential or commercial areas. The number is 1-866-4USDAWS. Birds can be forced to relocate using frightening devices such as gas-operated exploders or pyrotechnics, but these techniques should only be performed by professionals in compliance with all local ordinances. Keep in mind that this strategy will just move the flock to a new area, and will not resolve future issues. Trapping and removal of starlings is best conducted by a professional nuisance wildlife control operator. Shooting may be an option in rural areas. Check local ordinances before beginning this type of control. Click HERE for more information from USDA-APHIS-Wildlife Services about dealing with damage caused by European starlings. European starlings are an introduced species to the United States and are not protected by the Migratory Bird Treaty Act or the Illinois Wildlife Code. A permit is not needed to remove European starlings, their nests or young. However, the removal technique must not pose a threat to native bird species.